One of my favorite flower beds is right out the back door. It’s a little triangle that is always full of something growing from May through October. This year, I tried to snap a photo diary of the corner garden. 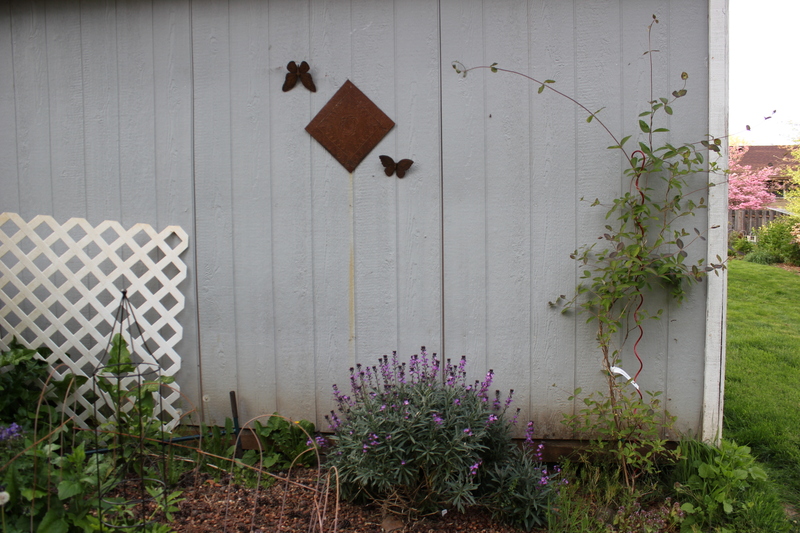 I missed April – when the grape hyacinth and the tiny wild violets are the only color in this little corner. The Dragon Lily (dracunculus vulgaris) ends May and starts June with its stench – and striking beauty. Even though the Dragon Lily is in full bloom, the corner seems a sea of green as the peonies fade, the milkweed and the asters push upward. July. The peonies and dragon lilies fade as the milkweed blooms, fragrant and alluring. The corner goes from one aroma (dead meat) to another (sweet milkweed) in a matter of weeks. August. The asters bloom when the milkweed fades – red and tall in the back, purple and lodged in a crack in the sidewalk. (The yellow mum was a potted plant.) 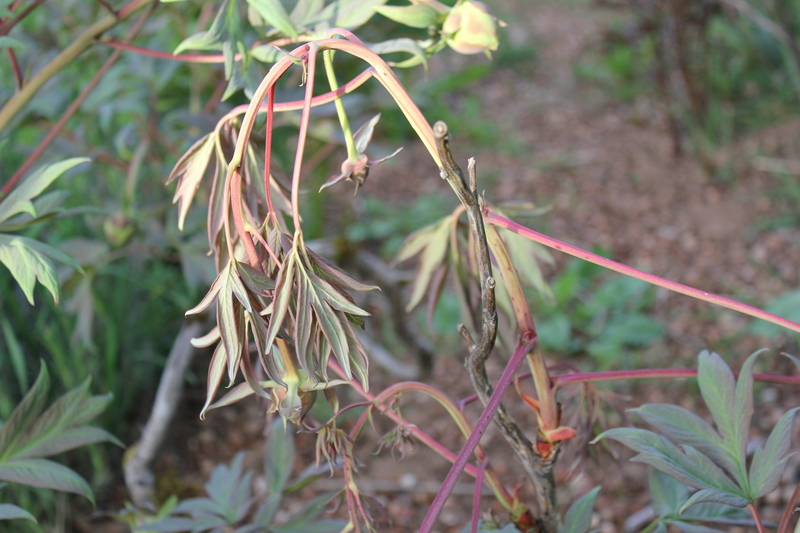 You can see the faded glory of the Dragon Lilies, seed heads brilliant red, and the peony leaves turning brown. Seed pods are forming on the milkweed plants now. And just like that the sun is low in the sky and September is leaching the color from the milkweed plants. It is late October now. The rains have held off. The leaves have fallen from most of the milkweed. 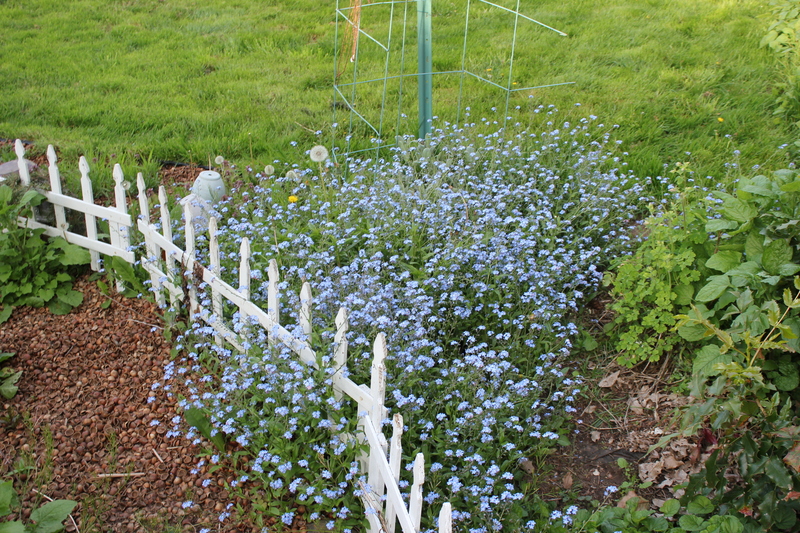 The asters cling to a little bit of green, but their blooms are all but faded now. Soon, it will be an empty space of grown, brown and sad, all the stalks cut back before the new growth begins again in April. The rains will come, the days grow dark and – for me – depressing. But the cycle will resume in four short months. The grape hyacinth, the violets, and the peonies came with the house and this little corner. 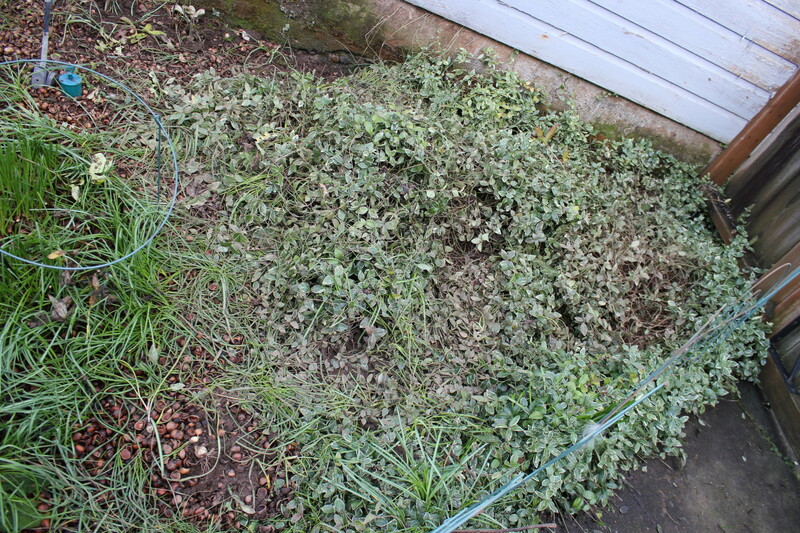 I pulled back a blanket of creeping myrtle (aka periwinkle or variegated vinca minor) to bare the ground. We planted the Dragon Lilies, babies from a single corm we stole from a rental many moons ago and have carried around with us for 30 years. (Want some? We’ll gladly ship – up to zone 8.) I planted the little purple aster from a plant a dear friend gave me some 25 years ago. It’s been divided and planted elsewhere, but this little bit insists on pushing up through a crack in the sidewalk right at the apex of the flower bed. The tall red aster surprised me that first autumn in the house – an added bonus of the many flowers already here and hidden by neglect. 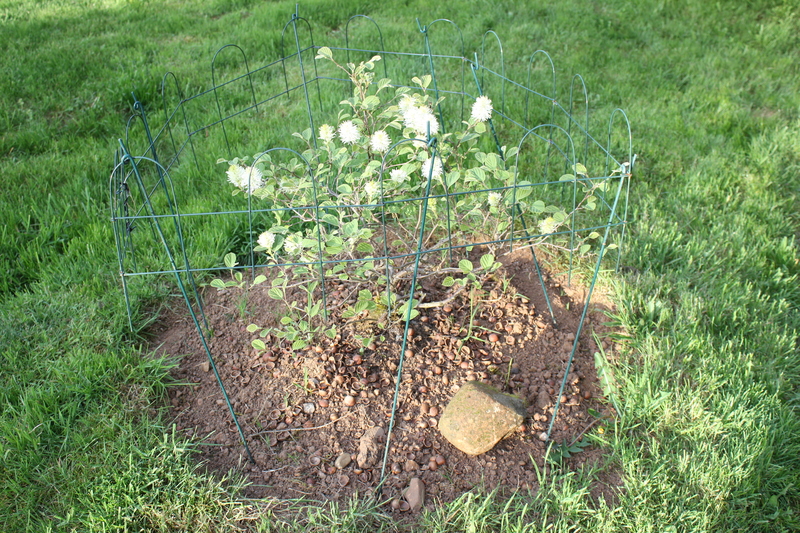 The milkweed, now – that was a project. I tried two or three times over the years to grow it by seed. I gave up four or five years ago, but one fine day three years ago, a small plant survived long enough for me to identify that it was, indeed, showy milkweed. 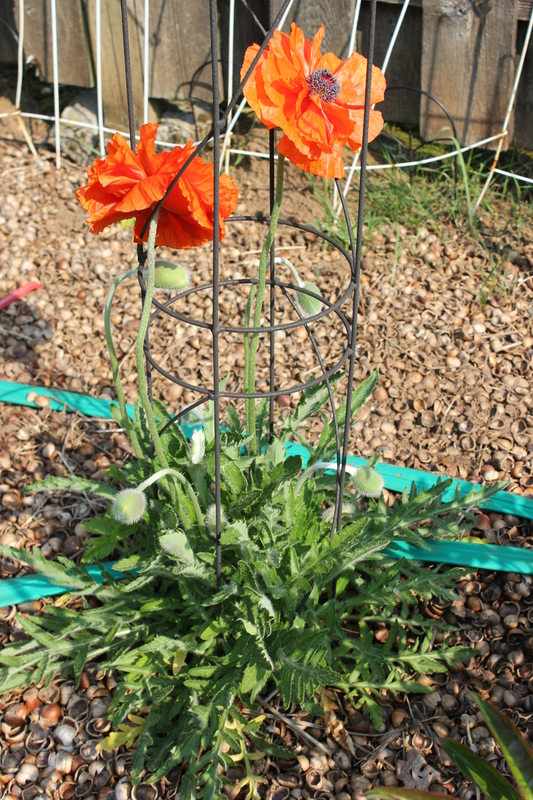 Last year, more came up and they flowered for the first time. This year, they tripled in number. They are truly one of my finer moments in gardening, even if they are now rather prolific. Writing Exercise #23 – What’s Up? I slipped up and did not post either Friday night or Saturday night. Friday, my office hosted a little meet-and-greet for past clients, and while I was not obligated to be there, I went for a couple of hours. I hate small talk, but sometime you have to do what you have to do, and I wanted to support my real estate agents. Small talk kills me, and I came home and dove into a movie instead of getting on the Web. Saturday, I gave myself permission to take the day off from responsibilities, writing, and plugging away at my website goals over at Two Crow Feather Woman. I did some minor chores. but most of the day was just a long, lazy, happy day. Today, I jumped back into responsibility. Groceries, laundry, feeding the birds. 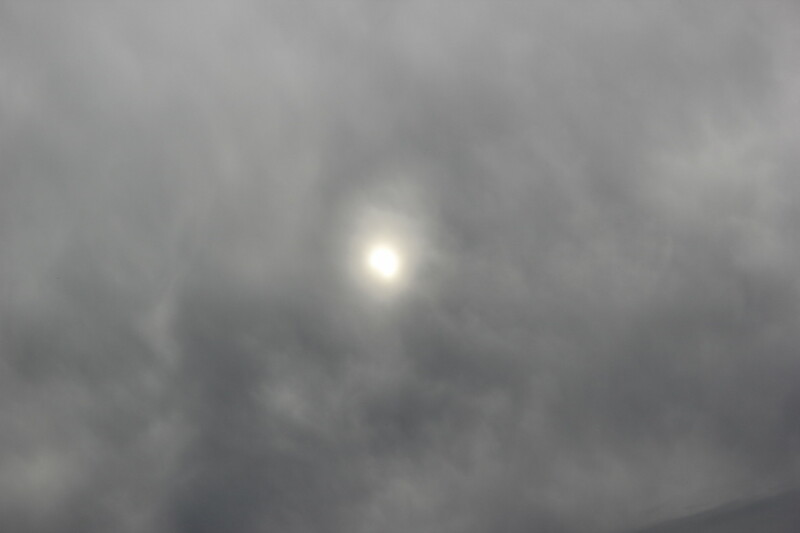 The sun came out, although a bit weak, what with high, thin, clouds. I dove into the garden. Who knows when next we’ll have a relatively decent and warm day to tackle the constants of a living garden? The rainy season is fast approaching and I admit that I am none too fond of working in the yard in the cold, finger-cramping, Autumn weather. This doesn’t look like much. I’ll explain: you are looking at a slew of yellow evening primroses (Oenothera biennis). I have wonderful childhood memories of the fragrance of these wafting on a warm summer’s evening. Then I grew up and forgot about it until some bird dropped these seeds into my yard and I decided to see what grew from the clumps. 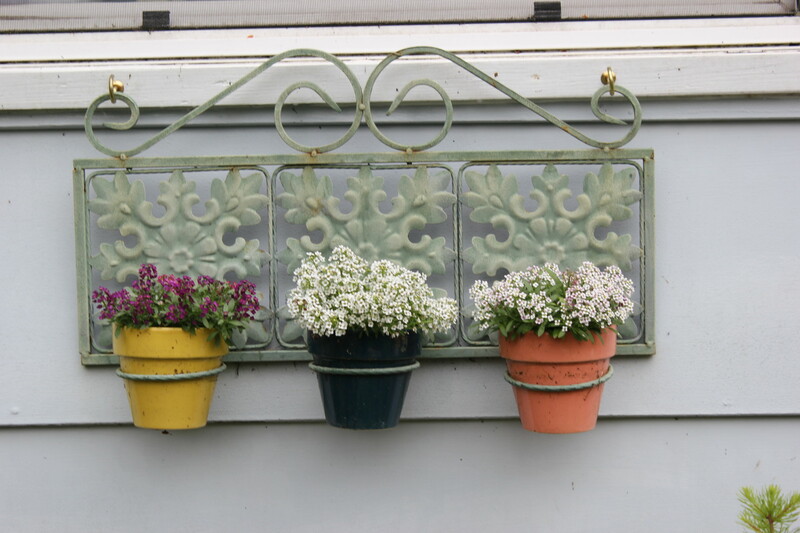 They are every bit as fragrant as I recall, and they are insect-friendly, hosting bees, moths, and hummingbirds. Occasionally, we even get hummingbird moths (common name for a sphinx moth that resembles a hummingbird, but which flies at night. The evening primrose blooms in the evening and fades with dawn’s light. 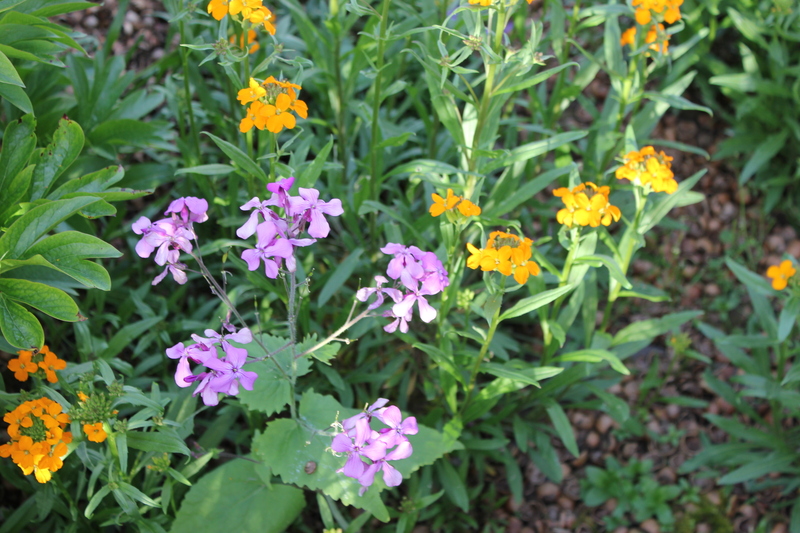 This year, they spread over the top of my beleaguered mountain penstemon, and I had to decide: primroses or penstemon? Oh, why choose either/or? I chose to pull apart the broad leaves of the primroses to find the living branches of the particular penstemon I have: something we dug up in eastern Oregon or the high Cascades and replanted in the yard. This particular kind grows much like kinnickinnick (I love that word! ): woody, close to the ground, and on slopes. 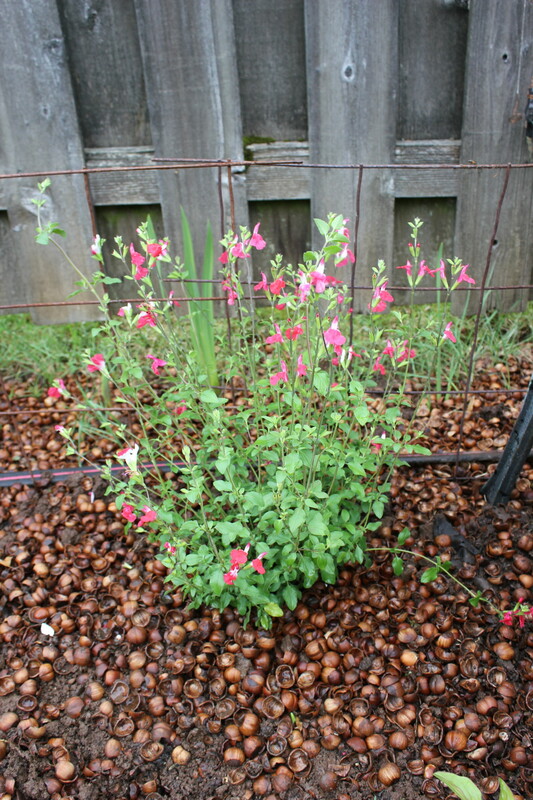 I planted it in three different areas of the yard, naturalizing it into the rocks. Well, that was easy, so why not tackle the irises? It is Autumn, and the best time to dig around irises. My irises survived the gravel drive of my folks’ house in Ely, Nevada, for decades. They were my mother’s, and a few years after she died, my father dug them up (he hated them) and boxed them, and shipped them to me. They survived the wet climate here, but every few years I have to dig them completely out and pull the grass out from between them. The grass is insidious. It strangles my other plants, from peonies to irises to gladiolas to my lavenders and the Russian sage. Anyplace that was a neglected flower bed when we bought this house, the grass creeps in and takes my garden hostage. I don’t have this problem in the beds I created since we moved in, only in the beds that were neglected by the previous owner. I have temporarily won: the irises have been replanted sans grass roots. Finally, I mulched a zone 9 plant out in the front garden (I live in a 7/8 zone), and I pulled out half the Hallowe’en decorations. I’ll put up the lights next weekend. 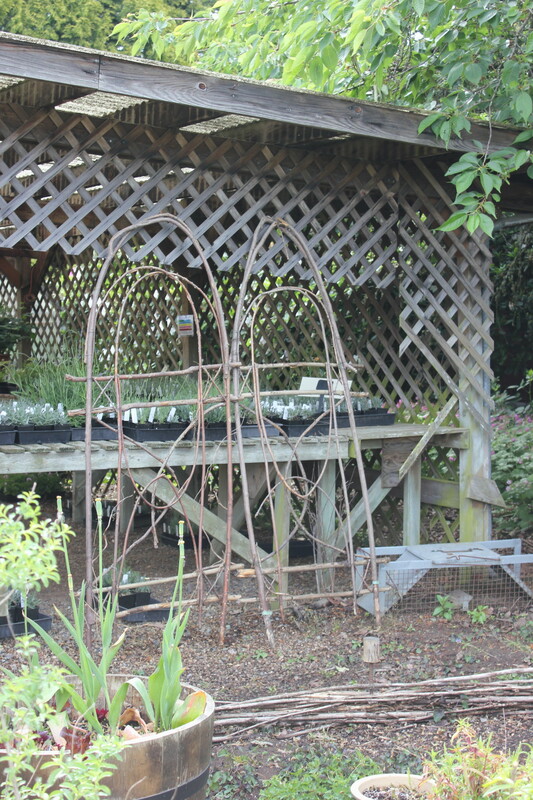 A number of years ago, I bought this fun wrought iron plant stand at a yard sale. 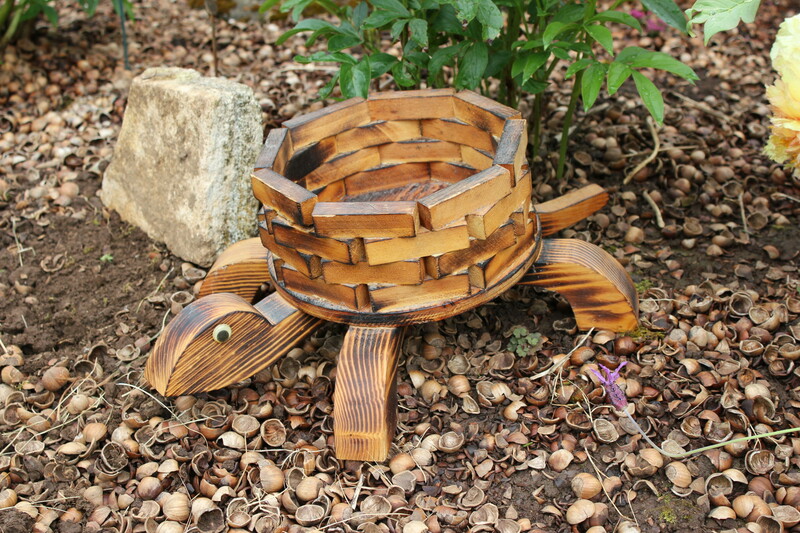 I was in love with it and intended to use it for a bird bath. The downside to the purchase was the ugly vintage pot that came with it (I couldn’t buy the plant stand without the pot). The upside was that I stopped at another yard sale where I purchased my little secretary desk, and the woman who helped me load the desk into the back of my car fell in love with the pot. I donated the pot to her for helping me load the desk, and we both gopt what we wanted. Later, I purchased a deep bowl at a thrift store, and – ta da! – had a bird bath. A bird bath that attracted bees and wasps to their deaths. Ugh. I tried a wire across the bath (photo with the dragon fly), but the birds and the dogs managed to knock it off all the time, and I still ended up with drowned bees, flies, and wasps. Last year, I made a little safety raft out of matchsticks, in the hopes the insects would crawl up onto it and thus save themselves. . Insects don’t understand the concept, and I continued to have dead ones in the bowl. The problem is the slick sides of the bowl. The porcelain that makes it so desirable for human use is deadly for insects. I don’t have that problem in this birdbath, poured of rough concrete. If insects land in it, they can get back out of it because they can grip the concrete. (Don’t ask about the crows that dump questionable food items into it, in an effort to soften up the Kentucky Fried Chicken leg bones so they can eat the bone marrow. Or worse. Crows are like raccoons, with a desperate need to “wash” their food first, and to the detriment of any other bird needing a bath or drink). This year, I saw a very neat idea for creating a bee watering station, and it occurred to me that instead of a second bird bath, what I really needed was a bee watering station where the bees, wasps, and flies wouldn’t drown. Now, bees and wasps play a very important role in our eco-system, and most wasps are not akin to the common (and hot-headed) yellow jacket or bald-faced hornet. In fact, most hornets are calmer than most yellow-jackets, and only become agitated if they feel attacked (like when you step on their nest in the woods). I will go out of my way to deal with a yellow-jacket nest, but I tend to leave all other wasps, hornets, and bees alone. We are in a bee crisis. Non-native honeybees are dying off, the native bees are threatened, and the rusty-patched bumblebee was just added to the Endangered Species Act. My yard is a veritable haven for native bees, from iridescent green sweat bees to tiny black bees to Mason bees to dozens of bumblebees, all the way to honeybees, mud-dauber wasps, and how-many-other wasps and bees I-don’t-know. Protecting them is as important to me as providing habitat for the birds that frequent our yard. Have I ever mentioned how dead this yard was when we moved in here, the summer of 2002? Not an insect buzzed and not a bird flitted through. We began organic (for the most part) gardening, feeding the birds, and added my first birdbaths. Now, the yard is a haven for buzzing and singing. The pictures on the Web that I found showed shallow bowls filled with clear marbles. I searched high and low at the thrift store until I found a shallow bowl that I liked (not plain white!). I already had a vase full of glass rounds and polished agates, so filling the bowl was a cinch. The frog was a bonus. When I switched out he deeper bowl, I found at least half a dozen drowned mason bees in it (already!!). My hope is to never find a drowned bee again. And I like the addition of color to my garden. And, yes, water. It’s not exactly utilitarian as a bird bath, but the bugs and birds can get a drink, and I get to enjoy the funkiness of it. I included slugs in the title of this post, and I really intended to have more photos for that portion of the blog, but it didn’t happen. Here’s the deal: we have a slug problem. I live in the Pacific Northwest, in the rain-forest side of the state. When I was a girl, my family would come from Nevada to visit here, and my sister and I took perverse pleasure in pouring salt on slugs to watch them die. It’s awful, and really not humane. I’m older now, and I like to just cut to the chase. I hate slugs. I loathe slugs. 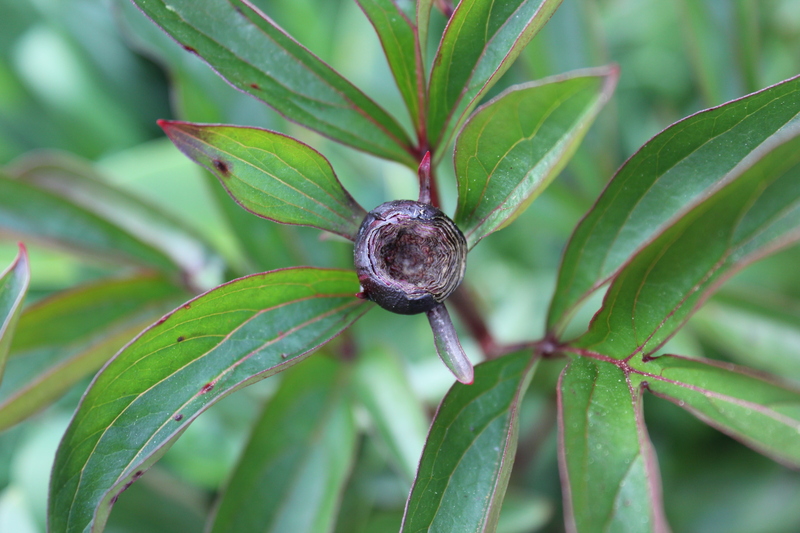 Non-native snails are right behind slugs on the loathe list, and neither one is loathed because of what it is, but because of the damage it does to my plants. Slugs are a special kind of pestilence in the garden, devouring irises almost as soon as they provide fresh greenery. I have tried everything. Beer in shallow dishes just provides you with a dish full of drowned slugs that you have to dispose of. Disgusting. And inefficient, because you have to 1) change the beer daily, 2) buy beer you won’t drink (which would be any IPA in my case), and 3) expensive because beer isn’t cheap. I’ve carried a bucket of bleach water around with me and tossed slugs into that. It’s as disgusting as slugs drowned in beer. I have (and still do) practice slug tossing (ala the book “Slug Tossing” by Meg Descamp, which I read many years after I decided the only real solution to slugs is poison. But Meg is hysterical, and I love her book). But, yes, poison. Corey’s Slug and Snail Death. You don’t want your pets or the birds to get into this stuff. So here is how I conquered that problem creatively. 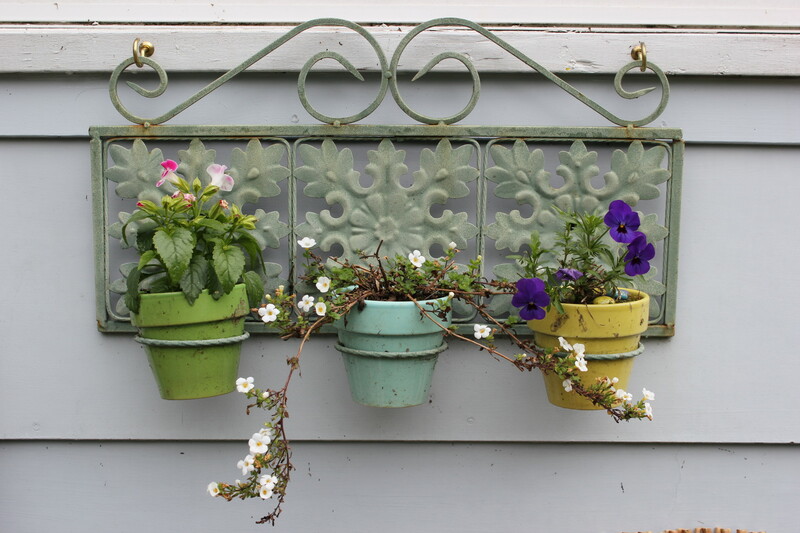 Use decorative ceramic planters. 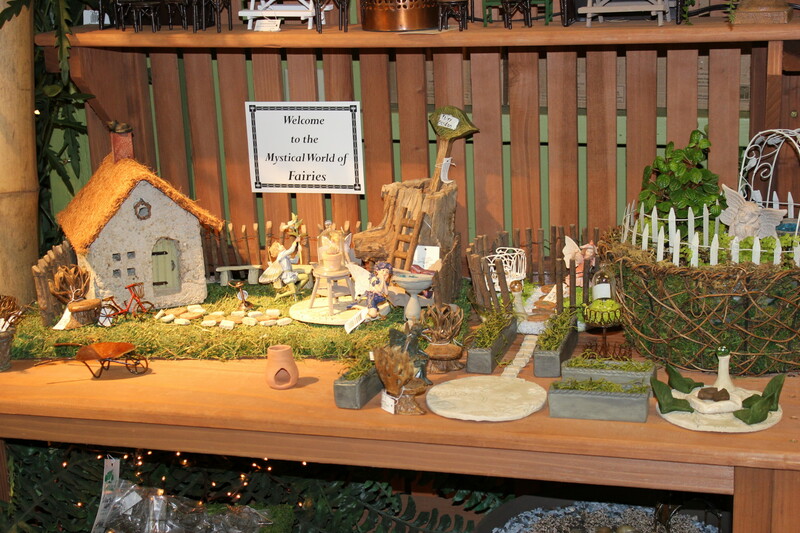 See that pot underneath the frog fairy planter? There’s a supply of Corey’s under there with plenty of access for the pestilence to get to it. 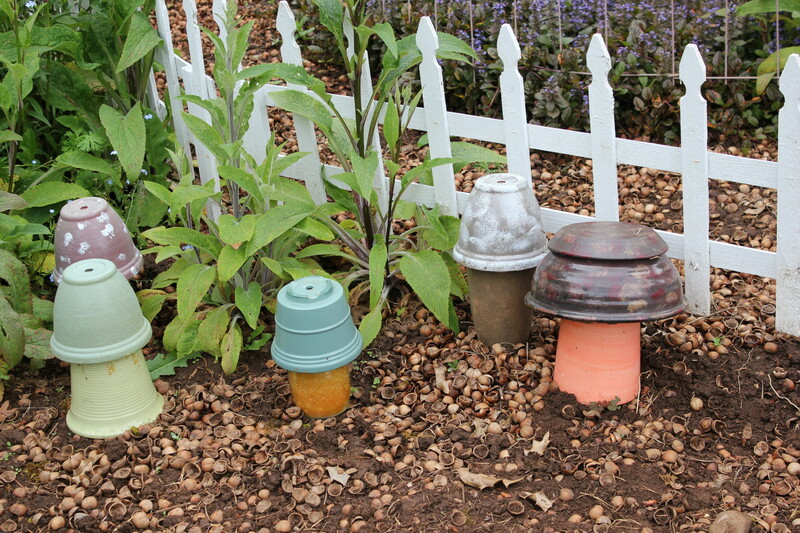 I set up these “feeding stations” around my garden, even where the dogs frequent, and always close to the plants the slugs like best. Dogs can’t smell it, birds can’t get to it, and slugs crawl in and die. They die, dehydrate, and compost and I never have to deal with their slimy carcasses, and nobody innocent gets poisoned. It’s one of the very few instances where I bow to the use of poisons. It’s not 100% effective (or, rather, slugs are more prolific than worms or bunnies, so it only catches the ones I want caught, and the rest go on procreating under the deck or whereever they hide in the daytime). I wonder how I came to have so many ceramic frogs?? This is my dad. He promised me that he would come back as this ceramic frog. I brought him home and, suddenly, I had a plethora of little ceramic frogs to put in my garden. Coincidence? Maybe. But I wouldn’t put it past Dad. Now – a total digression. I was going to take a photo of the chickadee watering station (aka ant moat) over the hummingbird feeder. EXCEPT that the female Anna’s was NOT moving out of the feeder. These are taken with the 50mm lens, from about four feet. Yes, she let me get that close. That ant moat above the hummer feeder is where the chickadees, juncos, and Townsend’s warbler get water. They disdain the bigger birdbath for the ant moat. I should write a book on gardening in the Pacific Northwest. Hmmmm. 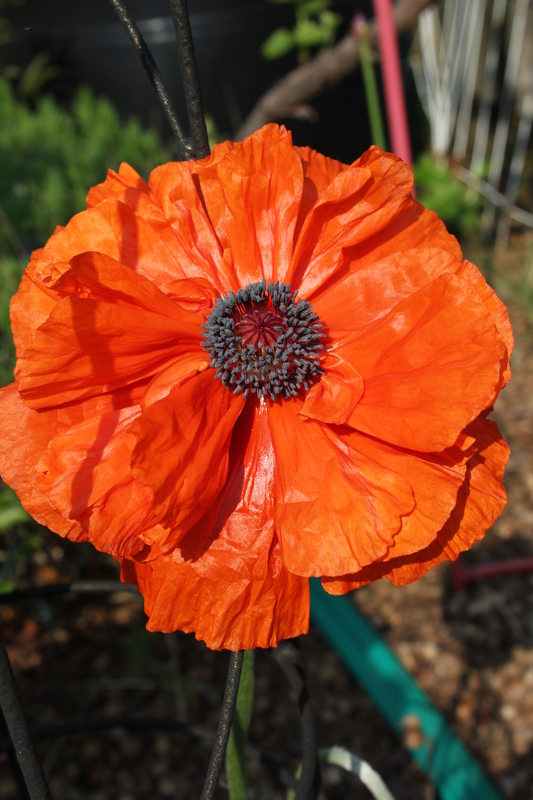 My Oriental Poppy bloomed overnight! What beautiful, papery petals! I think my heart stuck in my throat when I beheld it. A perfect flower. The weather was a perfect blend of sun and warm, and I had an entire weekend to play in the yard. What better way to start out a morning than to to find it graced by such beauty? 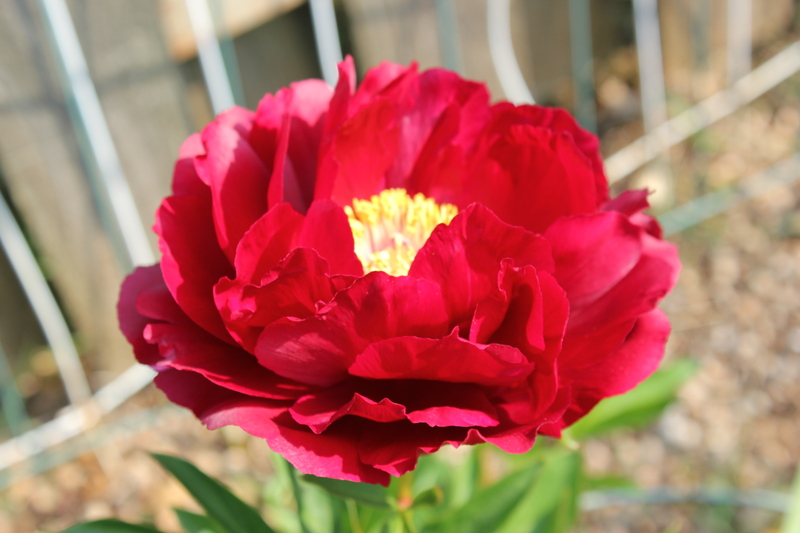 One blood-red peony opened up as well, the first of many peonies to grace the season. Have I ever mentioned how much I love peonies? I didn’t think so. The fact that we bought this house because of the peonies in the yard and the claw-foot bathtub in the bathroom probably has never once been mentioned here. I could look it up. 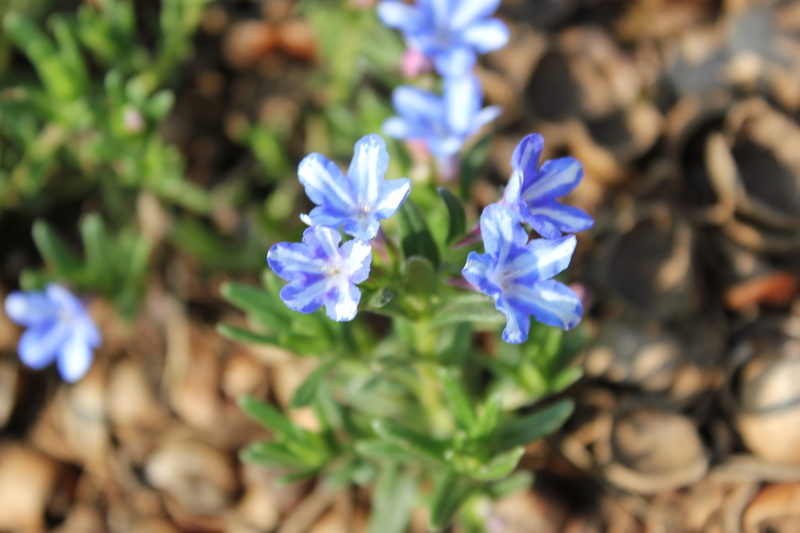 Lithodora, “Star”. There you go. 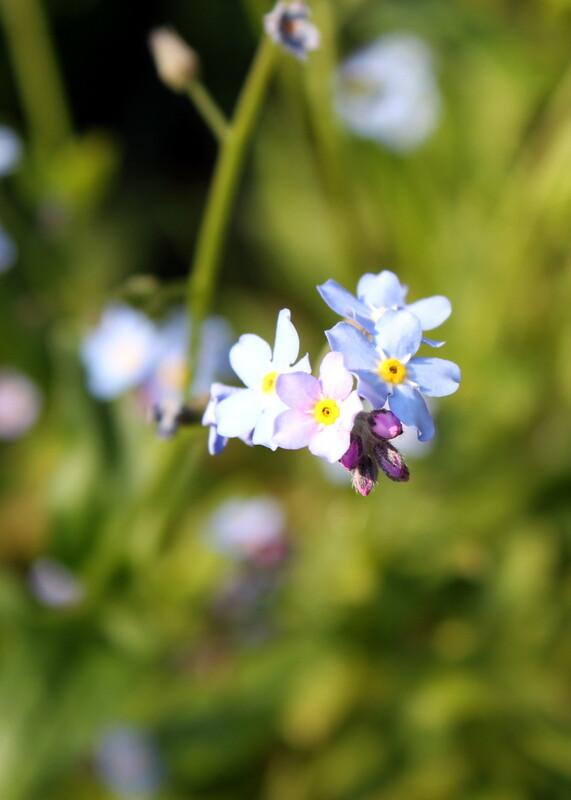 This little blue flower I know well: Forget-me-not. Lovely when in bloom and a pestilence in dog’s fur when the little hairy seeds form. I love forget-me-nots. 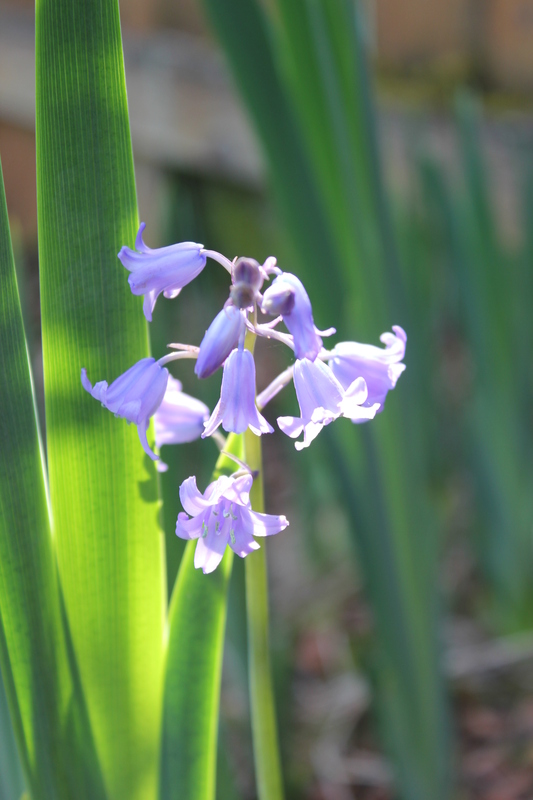 A random blue hyacinth. I’ve been finding these all over the yard, bird transplants from someone’s garden elsewhere in the neighborhood. 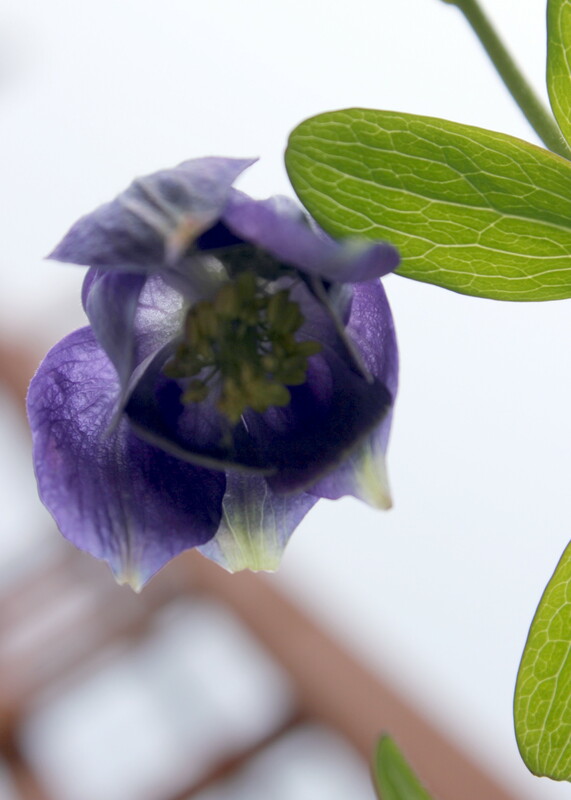 The first blue Columbine. 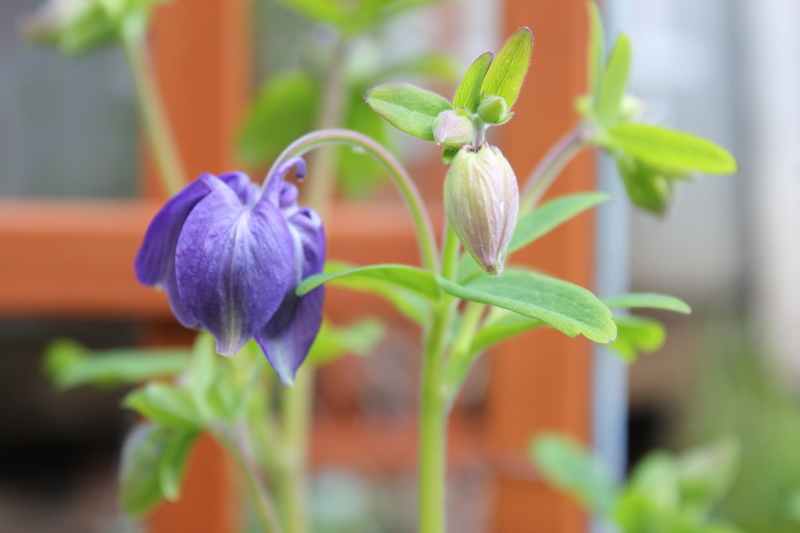 This isn’t a wild Columbine, but is a cultivar, probably from a packet of seeds I once purchased somewhere. I have several colors, but this is the first to bloom. Looking down on the world. Bees love this plant as do hummingbirds. 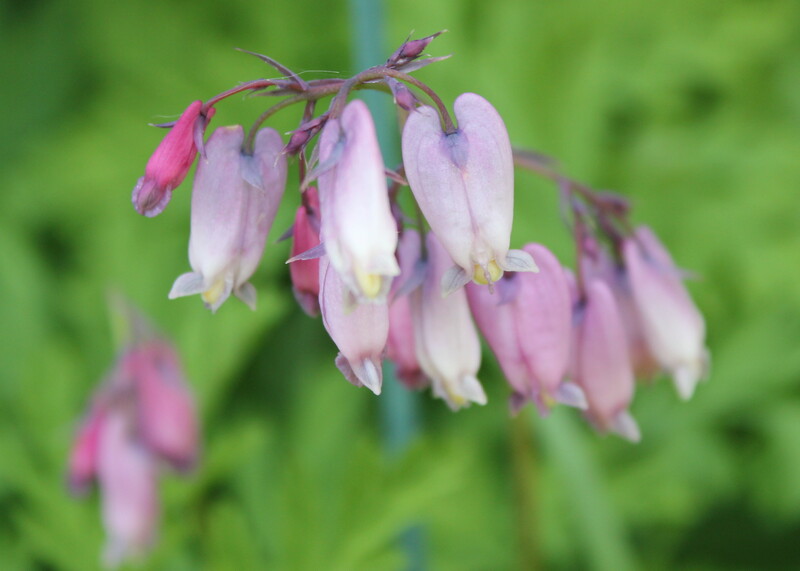 These Native bleeding hearts are uninvited guests to my yard. I noticed them only a few years ago, struggling against all odds under the handicap ramp in back. I left them alone and they have taken over the dark, dank area under the ramp. I take care not to plant them elsewhere because they spread… like wildflowers or weeds. 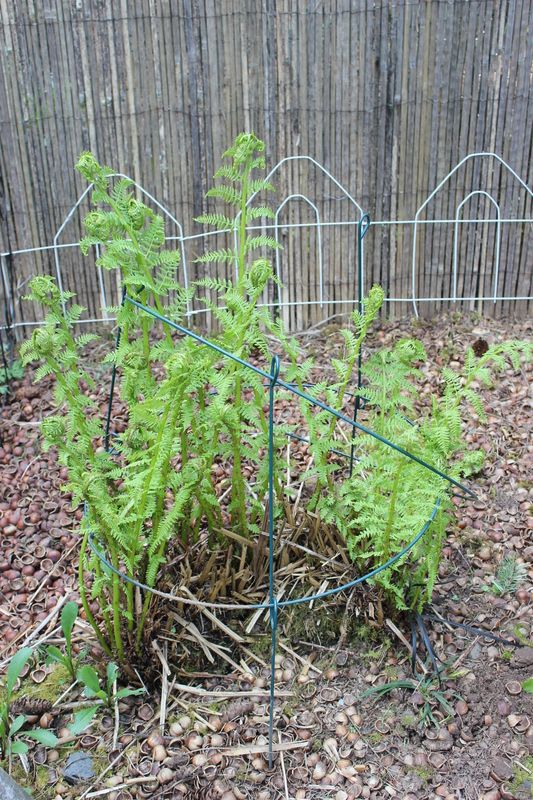 It is time to cut back the old fronds from all the sword ferns. 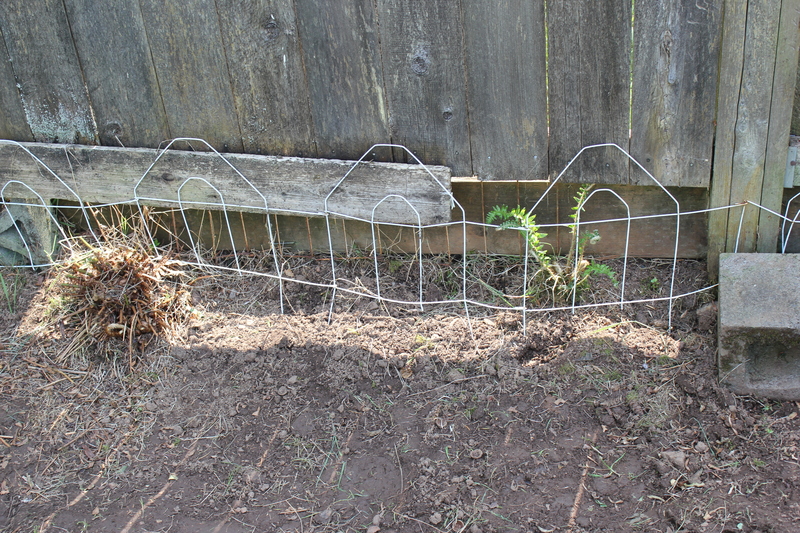 They look sad and pitiful now, but once the fiddleheads get growing… I’m trying to encourage the ferns to fill in some of the blank shady places in the yard, like this section of Harvey-proof fence. 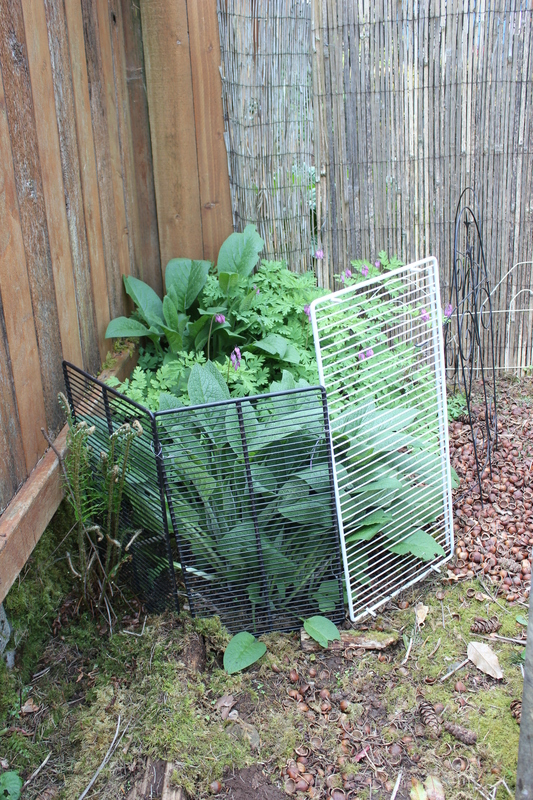 This looks funny now, but when the mertensia ciliata or mountain blue bells get to their full height of 3′ to 4′, I’ll be glad I did this to hold them up. This is a Native. I planted it and then discovered how invasive it is. I currently have it confined to two corners. It gets huge – not just in height, but in breadth. It’s in the borage family and the bees love it. Yes, I used old shelving to hold it upright. Reuse, Reduce, Recycle. I need to move this Lady Fern. It gets huge, but the fronds are so brittle that any traffic around them wreaks havoc on the beauty of this plant. Last beauty of the day – the California Lilac, ceanothus L. This tiny, fragrant, buds are about to burst open all over my bush! I’ll have to open the bedroom window at night so I can breathe their scent in while I sleep. 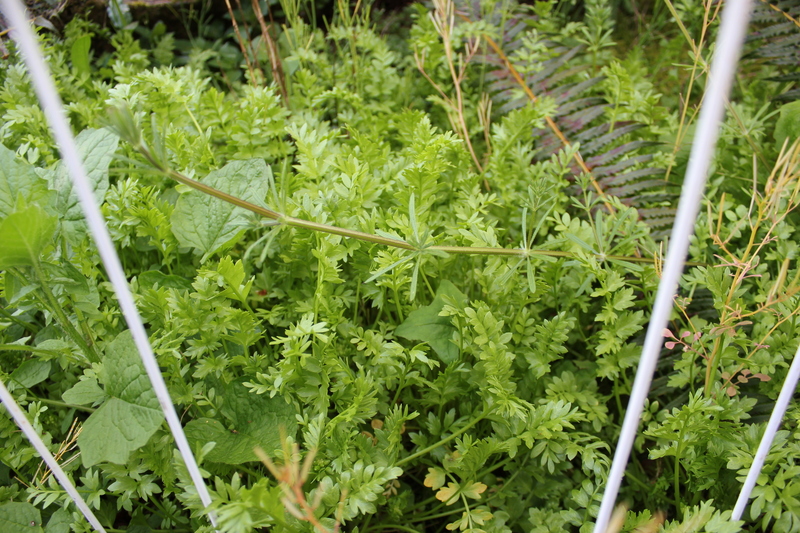 I spent a lot of today on my knees, pulling up grass and half a dozen other weeds. This year hasn’t been as bad as some years – either I’m winning the battle or the lack of snow and cold has given me a head start on the battle. I’ll take the win. 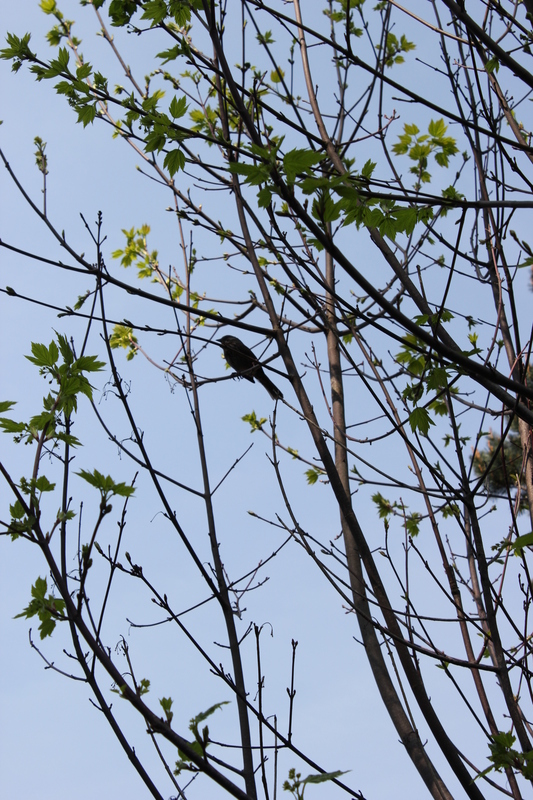 It leaves me more time to enjoy the birds singing. Which is precisely what this guy was doing, just three feet from my head. Sorry that he’s back-lit so you can’t make him out, but I can tell you what he is – and share a Youtube video of the song he was singing. Specifically, Spring in my back yard. Some Thing has been nibbling at my peonies. It has left perfect little round ruins of a few buds. No, it is not the ants. Ants and peonies go together. The peonies secret a sweet nectar that attracts the ants. I confess that I am somewhat confounded by the exact ant/peony relationship, but I accept that they seem to need each other. 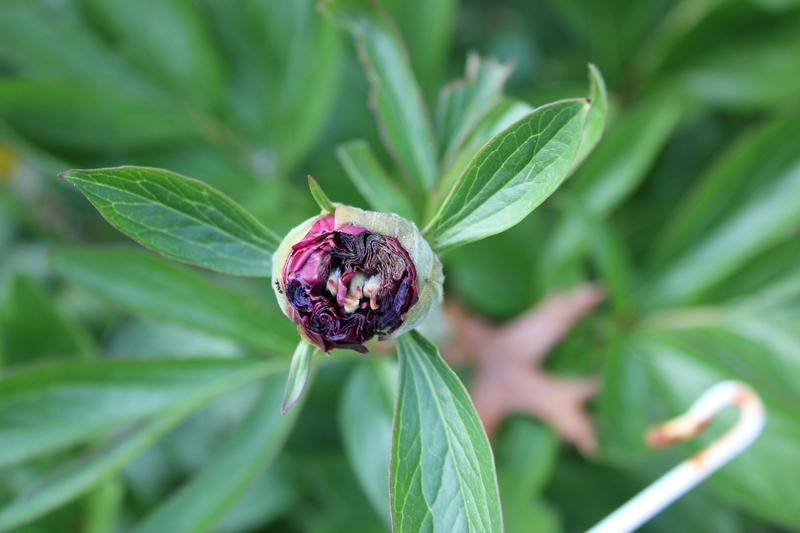 Now, if it were true that the ants keep other pests off of the buds, then I wouldn’t have peony pests eating away at the buds. 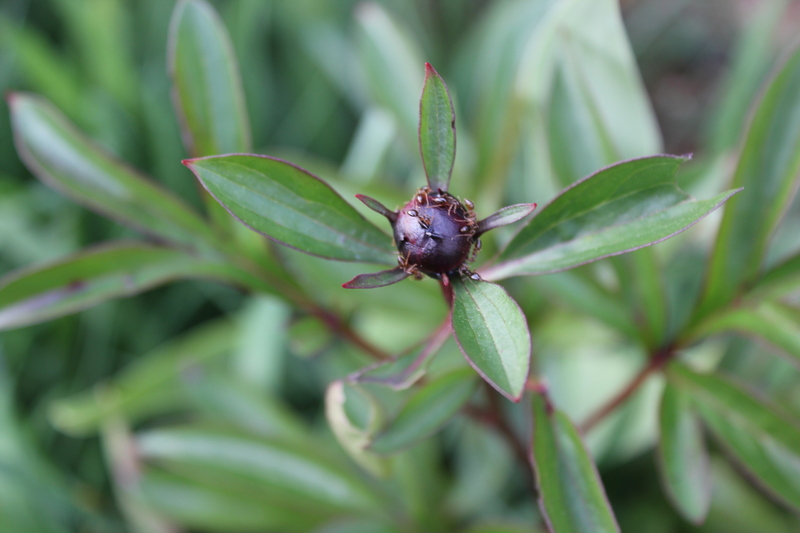 I figure that the peony nectar does me a favor by keeping the ants outside of my house. And that works for me. I have learned to pick my peonies and leave them outside overnight for the ants to abandon the flowers. The next morning, I can bring the flowers inside and there are no remaining ants to worry about. There might be a spider, but I gently nudge them off onto another peony bud so they can continue to feast on ants. This is a bigger problem with my peonies. There’s some sort of fungus in the ground that attacks my peonies, somewhat at random. I need to do more research on a natural remedy. I am not going to dig out all of my peonies! 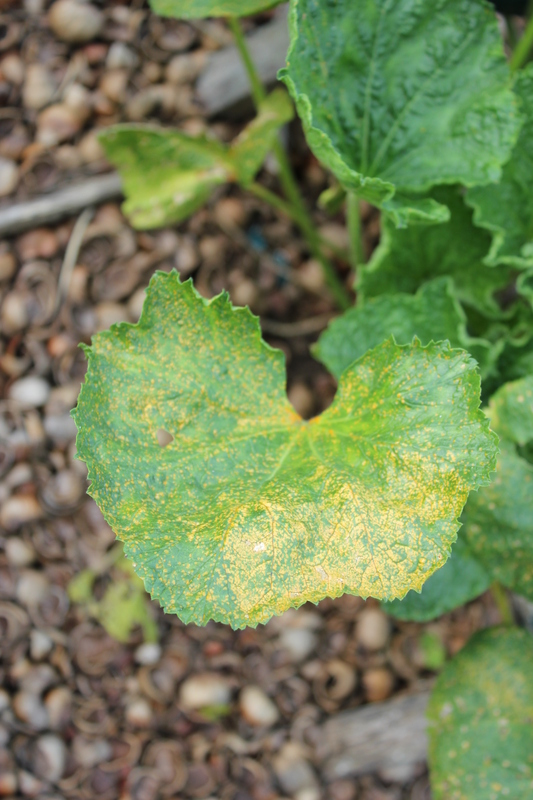 The constant rain and changing temperatures has cause rust to develop on some plants (the hollyhock is shown here). It’s not too serious and hollyhocks thrive despite it. My dad thought hollyhocks were weeds, but I don’t find that is true. I think he just didn’t like the earwigs that hollyhocks attract. I don’t either, but as long as earwigs stay outside, they don’t really bother me much. I like most insects in their natural environment. Ah! 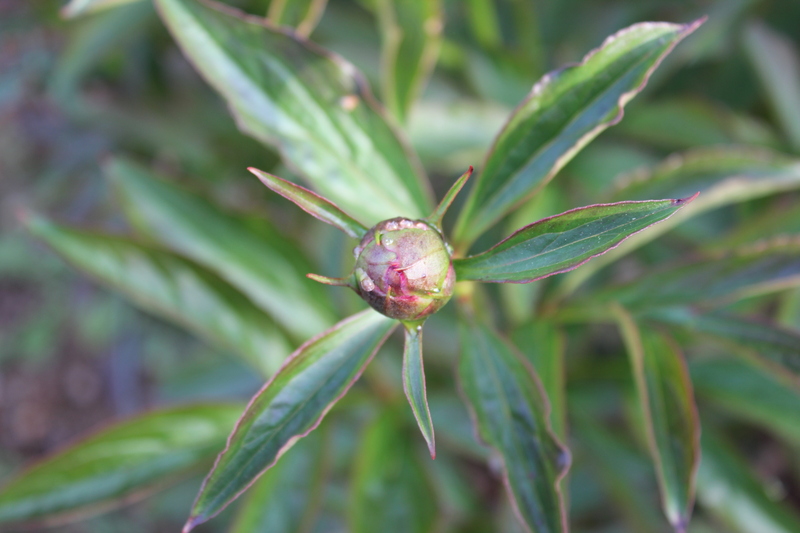 Hidden in the folds of this peony is the enemy of aphids everywhere. 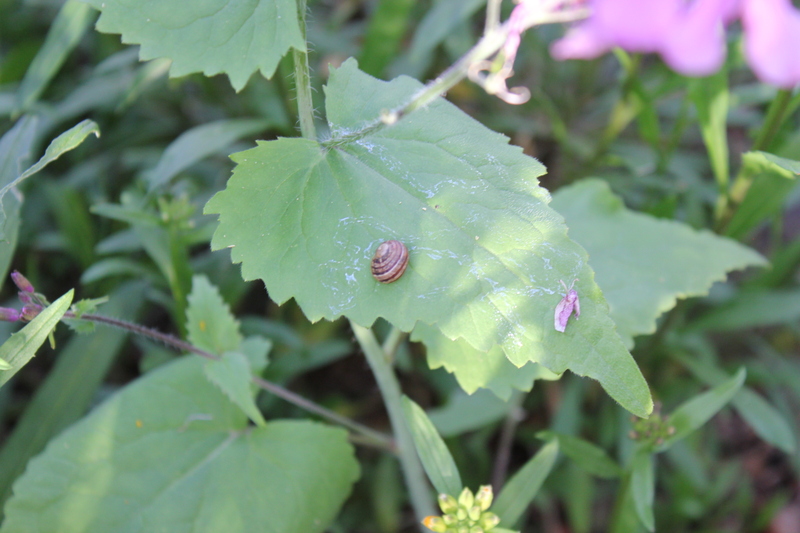 And scrolling slime on the leaf of the Honesty Plant (Money Plant or Silver Dollar plant) is one of the banes of my gardening experience: a snail. It’s a wee one and – hopefully – an Oregon Native. Native or not, the snail and it’s gastropod friend, the Pacific Northwest Slug (and there are a lot of different slugs!) is a plant-devouring pestilence. They also drown in Harvey’s water dish. Today was such a beautiful and mostly dry day that I decided to take advantage of the break in the weather and get some last minute gardening done. I rarely get an opportunity like this in November, and I had a number of peonies that I wanted to rescue from the choke-hold of the Creeping Myrtle. The Myrtle is pretty, but it grows thick and deep and eventually it chokes out everything that was there before. 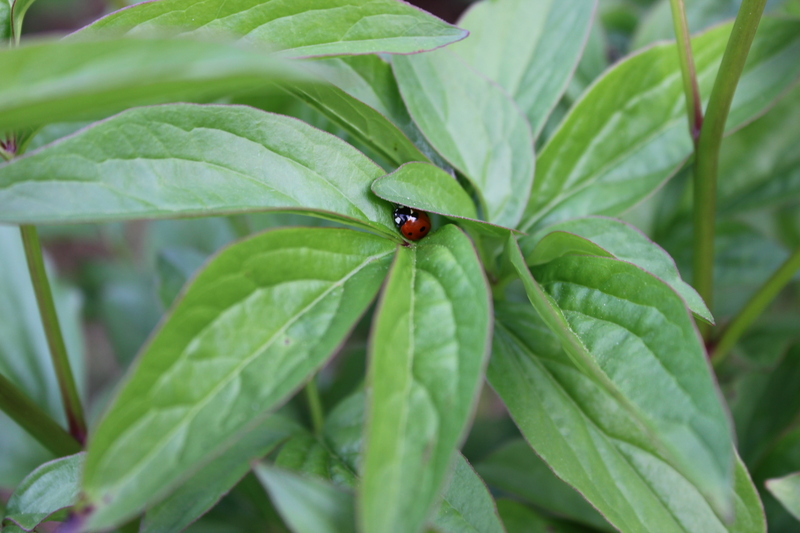 Fortunately, it does not spread as quickly as an ivy, and a gardener who pays attention can hold myrtle at bay, confining it to one corner of a garden by pruning it back. I like Periwinkle. 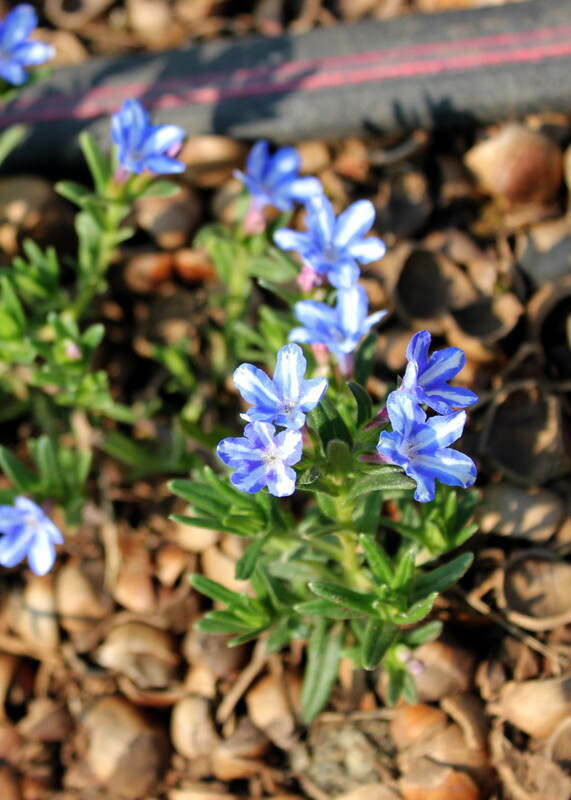 It has several names: vinca minor, Periwinkle, Creeping Myrtle. I call it all of those names. 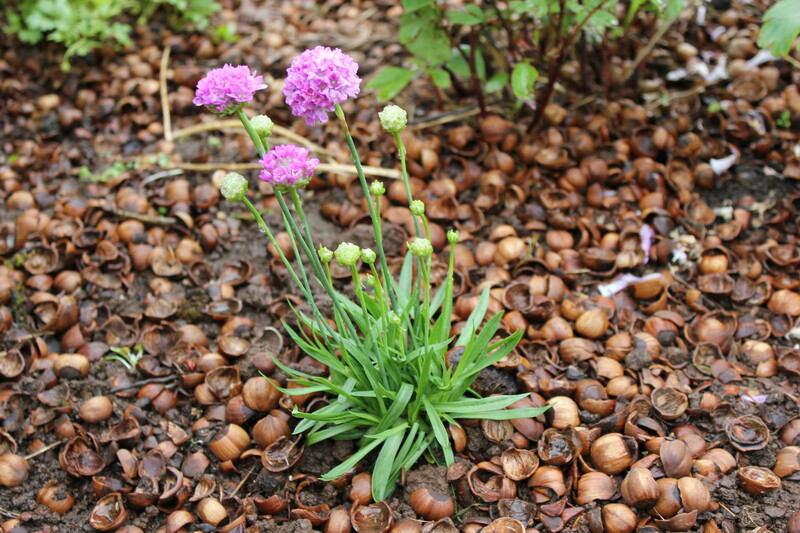 The flowers are pretty in the Spring and it makes an excellent ground cover that springs back from a lot of abuse. I did not plant the Periwinkle in my yard, it came with the house. It wasn’t as widespread at it is now, but I neglected that corner of the garden a little too long. That’s how it looked after I was finished digging and pulling and walking on it. It will spring back. That corner is also choked with grape hyacinth bulbs. I did not plant them, either. I do not particularly care for them, but the ground in that corner is so littered with their bulbs that I can’t make any headway in getting rid of them. I’ve tried. 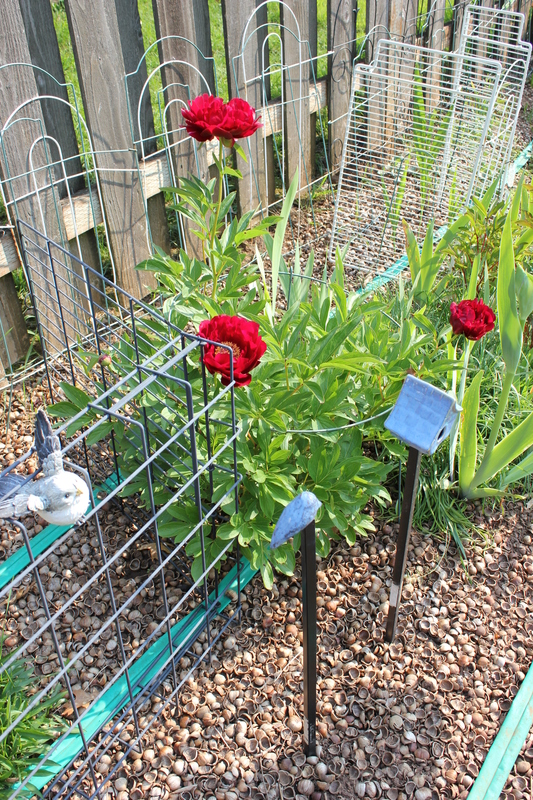 I divided five peonies and moved them to new plots. I dug up my purple aster and moved it to a sunnier and more open spot to allow for expansion. I also rolled back the Creeping Myrtle and dug out a handful of the dracunculus vulgaris bulbs (sometimes known as a “Voodoo Lily”. I found enough bulbs to make two more clumps of the smelly carnivorous beauty. As my husband said, I “shared the love” around the yard. 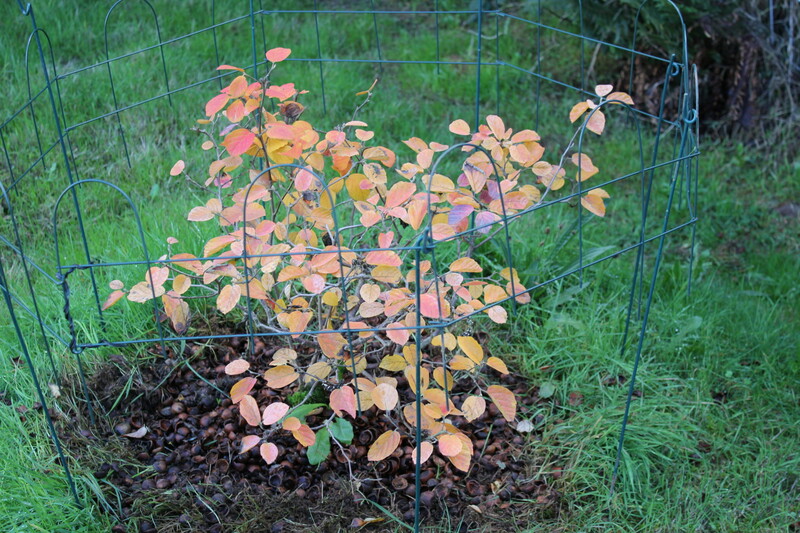 I wanted to weed the grass back from my Fothergilla Major Blue Shadow. 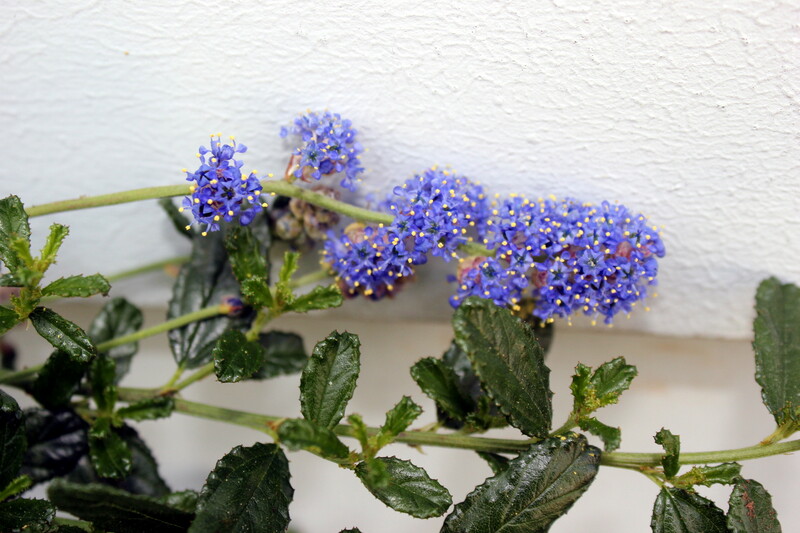 It is supposed to be a showy plant through three seasons: when it flowers, after it flowers with it’s blue leaves, and in the Autumn when the leaves turn bright red. Hm. Not quite bright red, but it is pretty. It’s behind a make shift “fence” because guess what dogs decided to use it as a marker? All that digging and dead-heading and moving and bending over left me sore and tired, and covered with mud from head to foot. It felt good. I may not think so tomorrow. 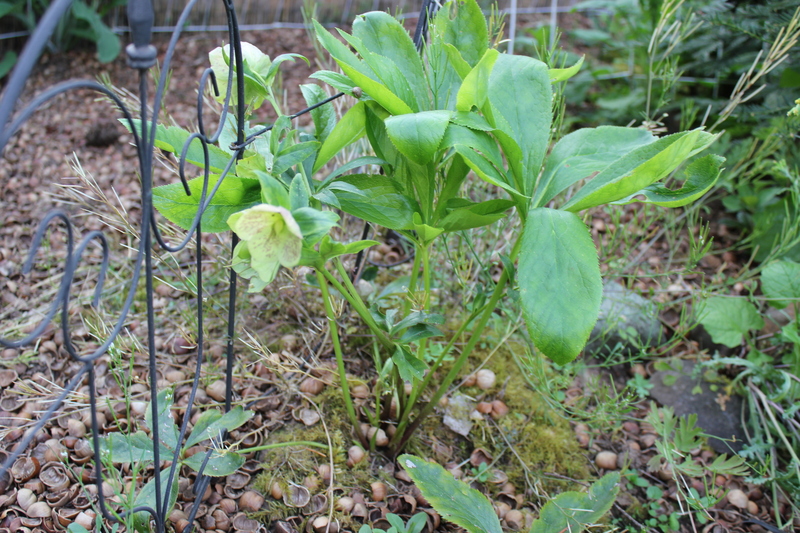 But I will think it was worth it next Spring, when the peonies bloom in their new locations and the “Voodoo Lilies” open their black hearts to spread the aroma of rotting meat around my yard. I am so weird, I like that. 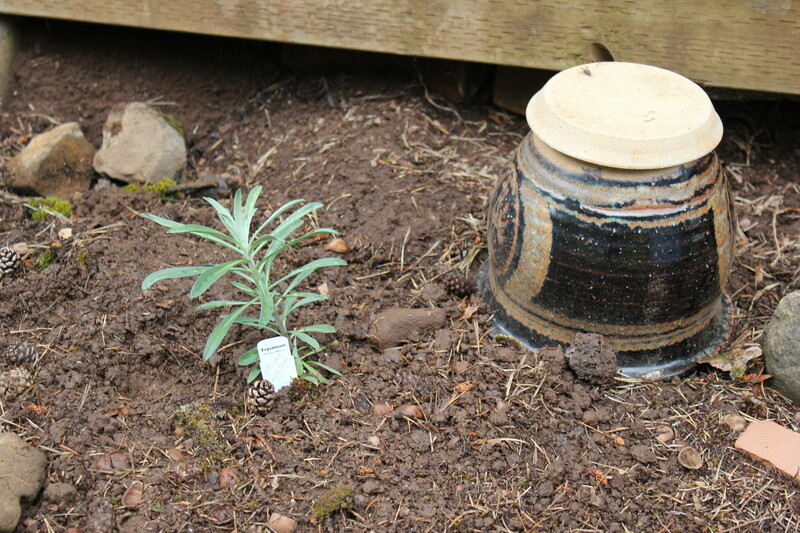 The real reason I am posting tonight is because I want to remember the names of the plants I planted today. I’m terrible at remembering the names of plants!I often revert back to my blog and the archives to look up the names of plants. After awhile, it comes naturally, but the initial memorization is not easy for me. It is why I carry several field guides with me every time we go out into the woods or desert:I look up the same thing until I have it memorized, and then I look it up because I want to reinforce to myself that I know what it is. We made our annual drive up the Willamette Valley yesterday to visit our favorite garden nurseries. We started at Nichol’s Garden Nursery where we have purchased garden seeds for over 30 years, usually by mail but sometimes by making the drive to Albany. Nichols is nested up against ATI Wah Chang, in a unique clash of commercial and concrete and the peaceful hazel-nut mulch lined paths through the herb beds behind the little red house that serves as the store for Nichol’s. Rose Marie Nichols McGee was signing books. She’s a delightful soul and while she wouldn’t recognize me from one year to the next, I always find her warm and genuine. And quite knowledgeable. I pointed to an unique purple plant growing in her beds and she said, “Cerinthe retorta. We don’t sell the plant, but you’ll find the seeds indoors.” I bought the seeds. We spent $24 at Nichols before heading on over to our other Albany favorite, Garland’s Nursery. They have one of the largest Bonsai collections around. They also usually have a lot of gift items and a plethora of plants I simply cannot live without. For whatever reasons, this year we left Garland’s empty-handed. We saw some interesting ideas, but nothing that jumped out at us, begging to be purchased. We’re not in the market for large shrubs or trees at the moment, and they have a wonderful collection of those. We turned around and headed back south on I-5 until 99E splits from the freeway. Then we meandered down 99E to Woodburn and Al’s Garden Center. 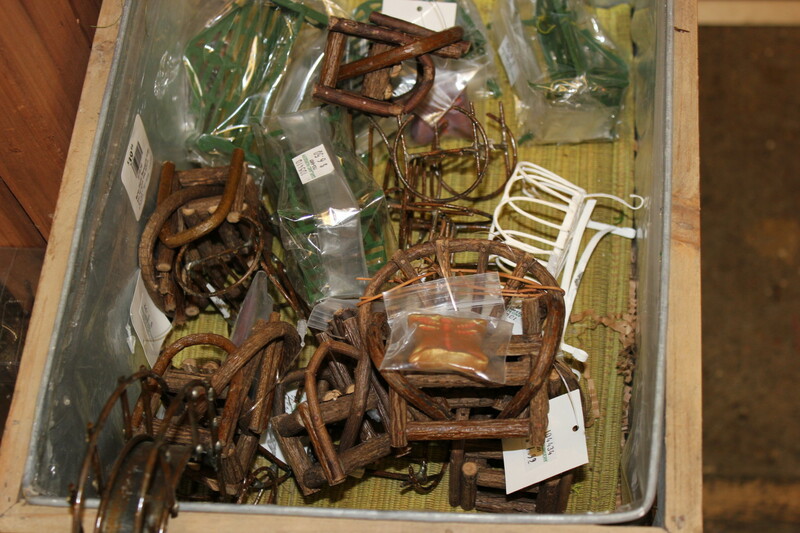 They also have a collection of unique and interesting gift items, acres of trees, and a very small Bonsai collection. 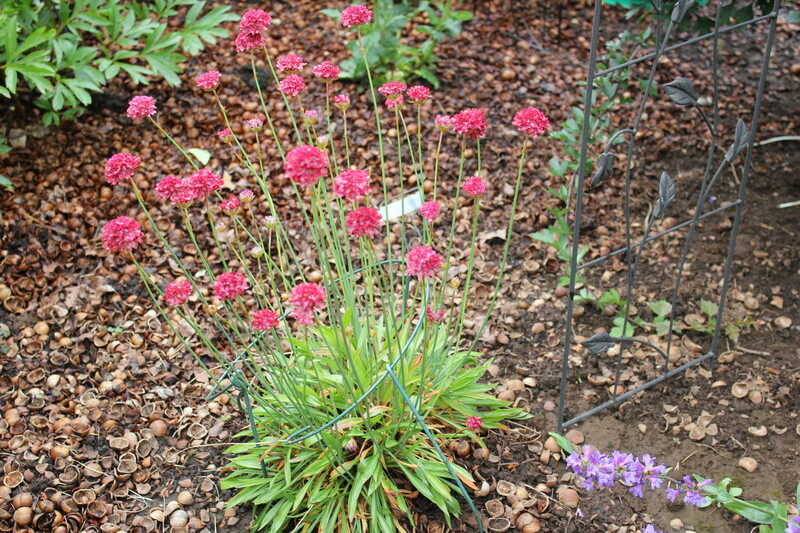 They are outstanding for perennials. I spent more money at Al’s, but I didn’t buy the beautiful clematis I’ve been dreaming of. I didn’t have enough money for that. Today I planted my plants. It makes an excellent cut flower and that was my goal this weekend: to add to the perennials that I can cut and cut and cut to enjoy indoors all summer long. This is one of two salvias I fell in love with at Al’s. Don actually picked them out. 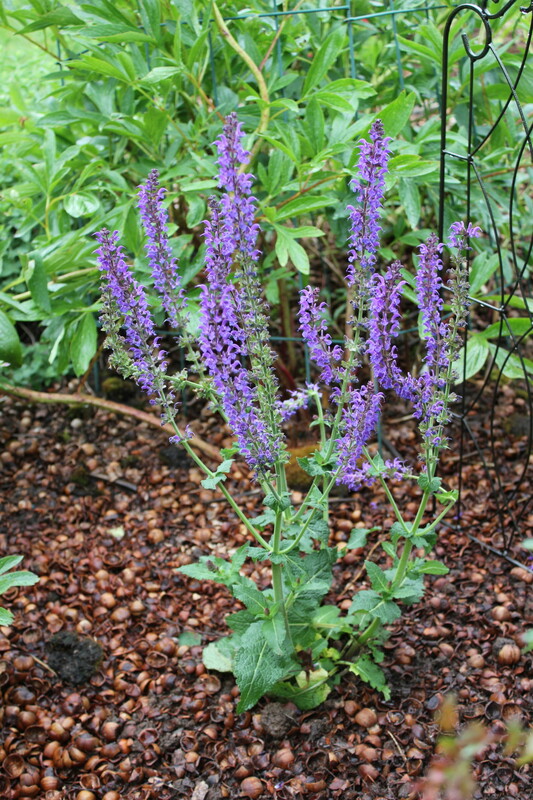 “May Night Meadow Sage” or Salvia nemarosa ‘Mainacht’. Blooms May- August as long as you keep it “dead-headed. I could scarcely not notice the strong sage aroma from this beauty as I put it in the ground: ‘Hot Lips’ Sage (Salvia ‘Hot Lips’). Those delicate red-and-white flowers will be a welcome addition to bouquets throughout the summer! Strange mushrooms popped up in the garden under the New Moon (or maybe it was the Solar Eclipse that brought these out?)! This is a transplant from Nevada. I found him in a shed behind my father’s old house. I remember my mom loved him and so I hauled him north. All he needs is a load of hens & chicks to feel useful. I’m pretty certain I can find some of those! This one (filled with Sweet Allysum). Hm. I need to remember to try to make some Faerie villages in my garden. I am not really into the Victorian Fairy theme, but no one says you have to populate a Fairy Garden with “The Beautiful People” of Faerie-dom. The ordinary folk are quite sufficient. A bin full of over-priced faerie furniture. Ideas, ideas, ideas. And thank God for the “no flash” setting on a good digital camera. My helper. He had a bad experience at Home Depot today. He loves to walk through HD, but he hates it when I have to stop and buy something. He also hates all the head pats and people oohing over him. So this woman says, “He’s an unhappy dog.” Really? She also lectured me on how fat he is. Hello?! I know: that’s WHY we’re walking at Home Depot. Sometimes people are too nosy for their own good. Harvey started wagging his tail again when we left the store. I have to share this. 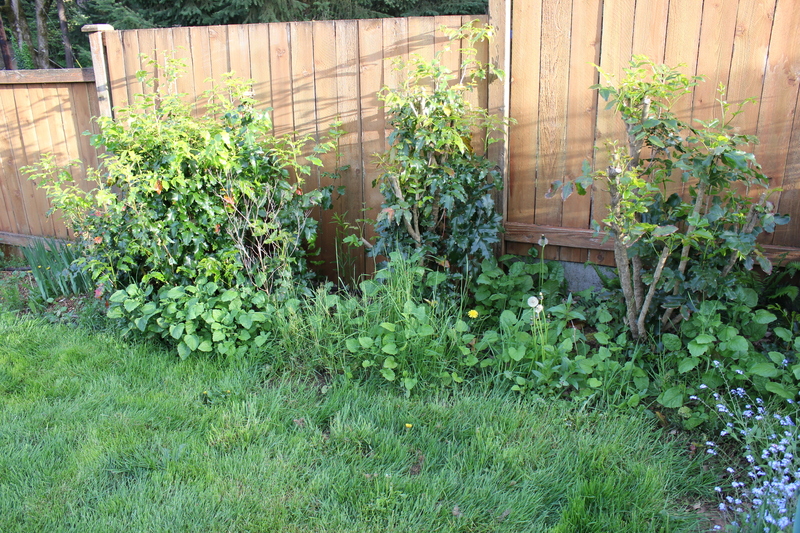 Several years ago, my husband dug up a vine maple and brought it home for the garden. The roots were entangled with a very young yew tree and a number of other wildflowers. This one took off. 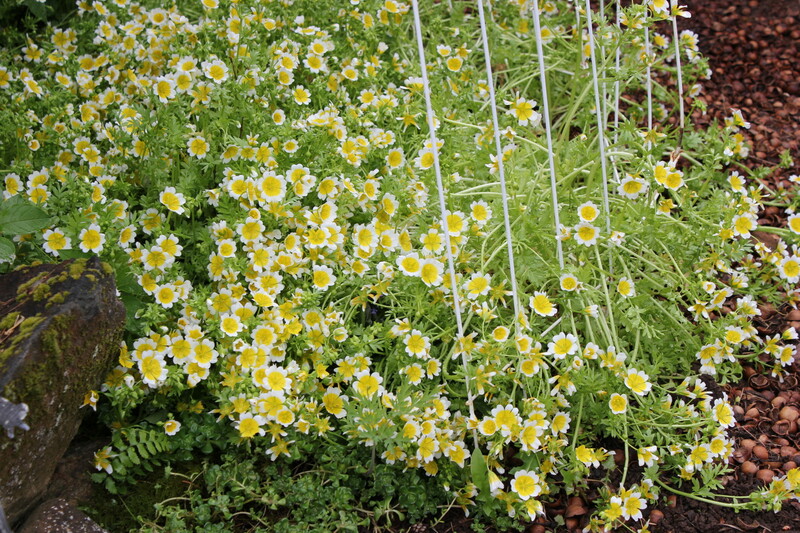 It is Douglas’ Meadowfoam (Limnanthes douglasii) or “Poached Egg Flower”. It only lasts a short while in the Spring and I enjoy every moment of it. 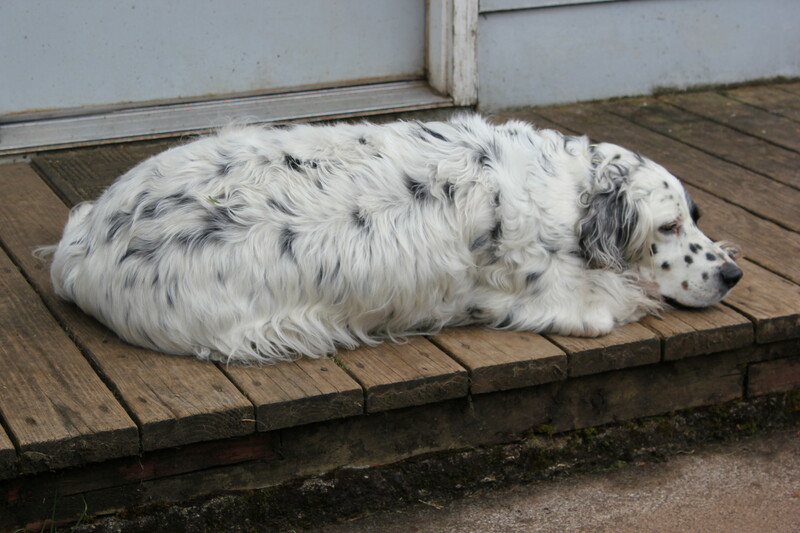 O have to keep it fenced off because the dogs like to curl up on it! Oh – remember why I was posting this particular post? So I could remember the names of the plants I bought? I like to add the Latin names here and there to make myself sound smarter than I am. I look them up. My husband memorizes them; I look them up. Last but not least: that solar eclipse that happened when the New Moon crossed in front of the sun. That was as good a view as I got of it. Maybe next time.